The first Suffolks were brought to the United States in 1888, but it wasn’t until after the second World War when the sheep industry moved towards a larger, meatier, open faced sheep that Suffolks gained in prominence. They are a large breed with a distinctive all-black head and legs that are free of wool. Suffolk lambs grow faster than any other breed and yield heavy, high cutability carcasses of the type demanded by today’s health conscience consumers. 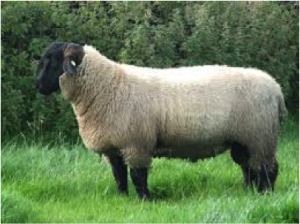 Suffolk is an original English sheep breed stemming from a cross between Southdown rams and Norfolk Horned ewes and the Suffolk has some of the greatest features of its parent breeds. The breed was recognized as early as 1810 in the UK and came to the United States, via New York, in 1888. They finally made it out to the western ranges in 1919 when several sheep were sold to the University of Idaho. From the Southdowns, Suffolks get size, the coloring on its face and legs, their meatiness and wool quality. From the Norfolk Horn, they get their hardiness. Mature Suffolk rams weigh from 250-350 pounds while ewes are a dainty 180-250 pounds. These are not small sheep. They are efficient feeders, good mothers and prolific milkers. They tend to be pretty darn squared off in shape and are very easily spotted a sheep show. A Suffolk fleece almost universally comes from a ewe, and weighs between 5 and 8 pounds and yields 50-60% once clean. They are downy, but softer, with a micron count of 25-33 microns. Typical staple length should be 2-3 inches.